Belrose Eagles invited Narrabeen Sharks to play a game of Masters as they celebrated 50 years since their first A grade grand final win. A Great day was had by all at Lionel Watts Reserve. Many tall stories of years gone by and good food shared, with Belrose hosting their life members. Belrose won the Masters game - 12 to 8. Thanks lads for the hospitality. Regards, Friendly (Brian Friend OAM). And yes I lasted out the game. The Belrose Eagles are a Rugby league team based in the suburb of Belrose in Sydney's Northern Beaches. Their colours are red and gold. Founded in 1955, the club has fielded both junior and senior teams in the Manly-Warringah district competitions, winning the A Reserve title in 1965 and the A Grade title in 1967. In 1955 a handful of rugby league fanatics from Forestville called a meeting on the steps of the old memorial hall to nominate an under 14 team in the Manly Warringah Junior rugby league. Unfortunately, insufficient players were raised and the team was withdrawn. As the competition draw was already done, Bill Bradley (life member) went on an impromptu door knock appeal to raise a side. In just two hours he had the numbers and Belrose RLFC was born. Later this year, an under 21 side was mustered. Coached by Manly and Australian legend Roy Bull, it included a 16 year old Frank Stanton ! In 1967 the Club structure changed and emerged as Belrose-Forest United. In 1971 The management of the club went through its most notable change and is incorporated as a limited company; Belrose Rugby League Football Club Ltd. In 1989 Belrose fielded 24 teams and win 5 premierships, most notably the A grade. In 1999 Belrose won their 100th premiership. In 2002 Belrose won the A Grade premieship for the 5th time. In 2003 The club wins six premierships in the most successful season since 1980. History was created when separate Belrose A grade teams won the Manly Warringah and North Sydney A grade competitions. In 2005 Belrose entered a team in the Jim Beam Cup, a competition comprising teams from the metropolitan area and the central coast. In 2013 Belrose won the NSWRL Sydney Shield Competition to obtain the highest level of achievement in the Club's history. In 2015 the Club celebrated 60 years and still remains a top Club in the Manly Warringah Junior League, always looking for young players from under 6 who love having fun playing football. An important juniors club for the Manly Warringah region, the club notes former players Frank Stanton, Geoff Toovey, David Ronson and current NRL star Jason King among other first grade and international players as well as the many hundreds of young local boys that have enjoyed the healthy social environment of junior rugby league within our club. The Narrabeen Sharks - Narrabeen Junior Rugby League Football Club had its beginning on March 7, 1932 in Jack McLean’s barber shop at the Narrabeen tram terminus. Jack McLean was elected the Club’s first President, W.Lloyd Secretary and P.Moore Treasurer. Other original members of the club were: Messrs D. Bryson, W. Pilon, S. Clayton, D. Elliot, T. Clark, S. Compton, C. Fletcher, J. Kirkwood, F. Aldridge and F. Crocket. Among the decisions made at the inaugural meeting was that the club enter “A” and “B” grade teams in the Manly Warringah Rugby League competition becoming the first registered rugby league club in the district. Those first two sides took the field in the same colours we play in today-BLACK and WHITE.Of the original members,Jack McLean and P.Moore served as President and Treasurer respectively until 1940 and Jack Kirkwood as Secretary from 1934 to 1940. In those early months of 1932 the generosity of Narrabeen Football Club supporters was established ,not unlike it is today, a Mr W Aldridge donated a football, Mr W Pilon donated his premises known as Pilon’s Hall in Octavia St. for a dance probably our first social function and Mr Moore donated the funds to cover the electric light bill. For the 1932 season the “A” Grade team made the semi-finals and the “B”Grade team won the inaugral Premiership a feat they also accomplished in 1933.In 1935 the”A”Grade won their first premiership a photo of the team including some of our early administrators is included in our photo gallery. In 1938 the”A”Grade won their 2nd Premiership and the”B”Grade backed up with Premierships in 1938 and 1940. Our History is very scant in the early 40’s but after World War 2 the club merged with North Narrabeen Surf Livesavers Football Club and won the 1945 “A”Grade Premiership,adding a “D”Grade Premiership in 1949.In 1946 Manly won the President’s Cup aiding their entry into the First Grade competition and in that President’s Cup side were 4 Narrabeen players,Max Whitehead (Captain),Meggsie Kirkwood,Johnny Bliss and Jimmy Hall.Kirkwood and Whitehead became our first representative players when they represented City from Manly in 1947 and in 1951 Johnny Bliss became our first Australian rep. when he played against the famous French side which included such legends as Puig Aubert and Ponsinet. Other notable Narrabeen players from these early days were Peter McLean who later captained the Western Suburbs side that won the 1950 Premiership,Hilton Kidd a very handy back in successfull Balmain teams of the 40’s,Billy Lloyd who represented Manly and City and Frank Collins who played for North Sydney and represented NSW. Early in the 50’s the club won a “C”Grade Premiership in 1951 backed up by an “A”Grade Premiership in 1952 a side captained by popular surf club character “Woofa”Barnett and coached by another famous local identity KG Adams.These Premierships were followed by “B”Grade in 1953 and 1956, “C”Grade in 1956,”D”Grade in 1955 and the inaugral “G”Grade in 1958.During this era the Club was ably served by such stalwarts as Russ Brown who filled every office available in the club and became one of our first life members,Neville Risk and KG Adams. The 1960’s began with a BANG for the club with the “B”Grade winning the Premiership in 1960 and the “A”Grade in 1961,these sides included some classic Narrabeen identities Bill Thrussell,Nev(Mouse)Chaney,Bo Bo Kerr,Kenny Holmes,Mick Geros and Dave James.Some of these blokes are still around at the time of writing this history (2007) and Kenny Holmes still cooks the BBQ at Lake Park.The club was manned in the 60’s by hard workers like Jim Pounder,Jim and Jack Kinninment,John Dean,Bill Stuart and of course Russ Brown. Their was confusion up to this stage of the club’s developement as to whether we were the Narrabeen football club or the surf lifesavers football club so in March 1964 the name of the club was officially changed to the Narrabeen Junior Rugby League Football Club which stands to this day.In 1964 the “J”grade won the premiership,a side coached by Jack Thompson and included his son Alan who was to become one of our Internationals.The same side went on to win the “I”Grade in 1965 and the “H”Grade in 1966,the winning of 3 successive premierships a club record at the time.In 1965 the first canteen building was used a caravan purchased for 150 pounds and in operation at Lake Park and in 1967 the ground was fenced. As the club grew we became a major part of the senior club’s nursery and in 1966 supplied 9 players in the Manly President Cup squad- R.Thompson, Y. Krilich, R. Parkes, N. Pounder (Captain) ,T. Jones, G. McIntosh, R. Budnik, J. Hornery and J.Hunt(vice-captain).Alan Thompson, Wayne Montgomery and Ken Hodges were selected to play S.G.Ball in 1968 and in 1969 Rob Dean and Greg (Yogi) Field also played S.G.Ball. The 70’s arrived and in this decade we were served admirably by Russ Brown, Jim Pounder, Merv Spence,Mike Peters, Brian Stewart, Barry Hall and John Lawler in the 3 senior positions of president,secretary and treasurer with Brian Stewart filling each post at some time during this period.In 1970 we were premiers in D,I,N2 and N3 grades,the “D”grade side included Alan Thompson,Mick Adams,Greg(Yogi)Field,Wayne Montgomery,Rob Dean and Ralph Stretton to name a few and Alan Thompson and Yogi represented in the Manly Jersey Flegg team.When promoted to “C”grade this side won the competition in 1972 providing 8 players in the Jersey Flegg side of 1971. 1971 saw the construction of new canteen and a dressing shed at Lake Park and the emergence of a new era of footballers who would play many games over the next 15 odd years.They were the mighty “J”grade of 1969 (Minor Premiers and Grand-Finalists) then Premiers in 1970, Undefeated Minor Premiers in 1971, Premiers in 1972, Undefeated Minor Premiers in 1973 and Premiers in 1974. Included in these sides were Mick Butler, John (Togo)Tyler, Chris Montgomery, Mark Gartner and Cliffy Law.In 1972 we won the “H”Grade premiership with the same side completing the double winning”G”Grade in 1973.This side included Mark Walsh,Gabby Williams and Warren”Mullet”Law.The Jack Kirkwood Trophy was inaugurated in 1972 for outstanding service to the football club and the inaugural recipients were Sue and John Field,sadly John passed away the following year.Our canteen was dedicated to his memory that year and still is to this day. 1973 saw the first appearance of the now famous “SHARK”emblem and we became the Narrabeen Sharks.The 70’s were a great era for representation even to the highest level for our club,notable rep’s were Mick Adams,Alan Thompson,Greg Jones,Steve Lawler,Russell Gartner and Johnny Gibbs to grade with Thommo, Gartner and Gibbsy representing Australia.Steve Lawler was a member of the winning 1974 Jersey Flegg side, Mark Gartner captained the 1973 S.G.Ball and besides the above mentioned players Dave May, Greg Field,Ralph Stretton, Mick and Peter Butler, Michael McGuiness, Perry Tauro, Ian and Rod Wallace, John Tyler, Brian Sims, Mick Donaldson, Phil Rosati and Kerry Johnston represented in Presidents Cup. Other events that occurred in the 70’s were Ray Hatcher coaching the S.G.Ball side in 1974,the emergence of the coaching career of Jon Clark ( ex grade player for Western Suburbs and Parramatta) who won the “B”Grade premiership in 1977 and undefeated in 1978 ably assisted by Mick Adams.These sides formed the nucleus of stunning success in the next decade.In 1979 the club won it’s first Pop Hall Trophy presented to the most successful junior league club based on a variety of critical points.Sadly the 70’s were marred by the passing of Jack Kirkwood, Col Mills, Ray Chappell and Jim Ginns who all contributed greatly to the Sharks. The Narrabeen Sharks Masters of Rugby League Club was founded in 2005 by Kevin Groves. 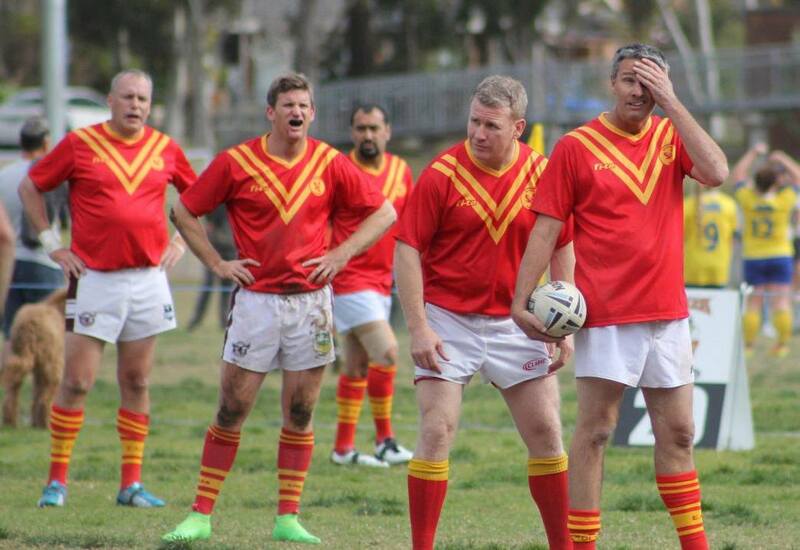 Masters of Rugby League is a game for any person over the age of 35. The emphasis is on sportsmanship, goodwill and playing Rugby League. We are seen as a family club and all of our 30 players and their families reside in the Northern Beaches community. 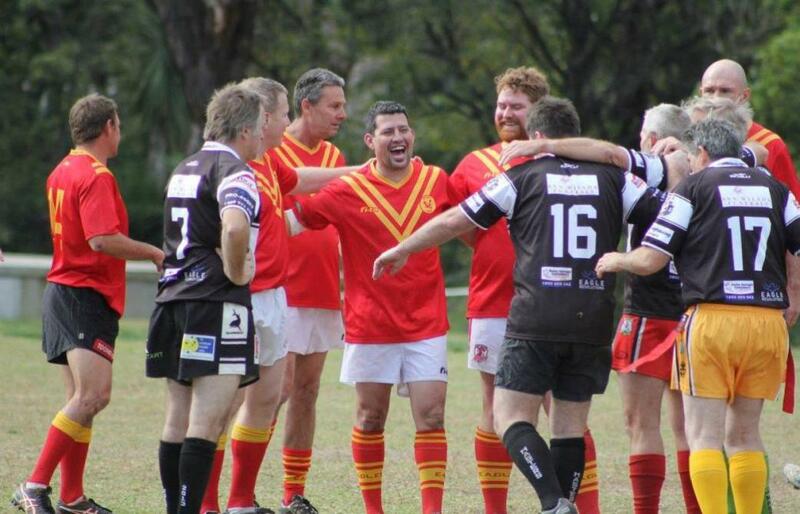 Our club will be field two teams in the NSW Masters of Rugby League Competition, held across Sydney and regional areas.